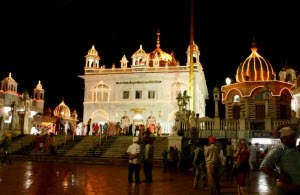 More than 4 million devotees are expected to assemble at Nanded, Maharashtra, India to celebrate the occassion of 300 years of Gurta Gaddi of Sri Guru Granth Sahib Ji on 30th October, 2008 and Joti-Jot divas of Sri Guru Gobind Singh Ji on 3rd November, 2008. The celebrations began on Simran Diwas, 15th November 2007, when the devotees across the world meditated, participated and celebrated together. For 15 minutes, devotees everywhere recited the Mool Mantra together. On the same day, commenced the Jagriti Yatra, a journey of faith from Nanded to the world. A rath carrying the puratan hand written Bir of Sri Guru Granth Sahib ji & Shastars of Guru Gobind Singh Ji & other shaheed Singhs started it's journey. Jagriti Yatra has covered almost 200 cities in India & culminated on 10th August in Nanded amongst great devotion.